257 ANONYME. 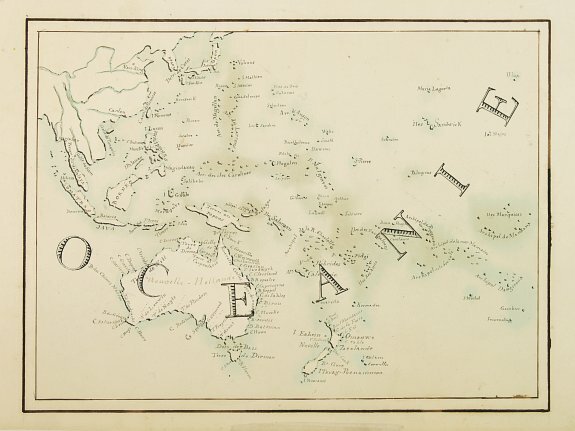 Oceanie. Ca. 1850. Original colours. Manuscript on paper. 223 x 297 mm. ORDRE D' ACHAT / Inquire/Order item N� 1830. 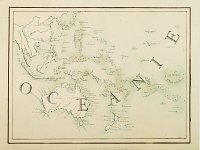 � Decorative manuscript map on paper covering South East Asia, Australia and New Zealand. 258 LEVASSEUR,V. Oc�anie. Paris 1850. In original o/l colours. Some marginal age-toning. Repair of a marginal tear in upper right corner, just affecting printed area. 285 x 420 mm. ORDRE D' ACHAT / Inquire/Order item N� 21901. 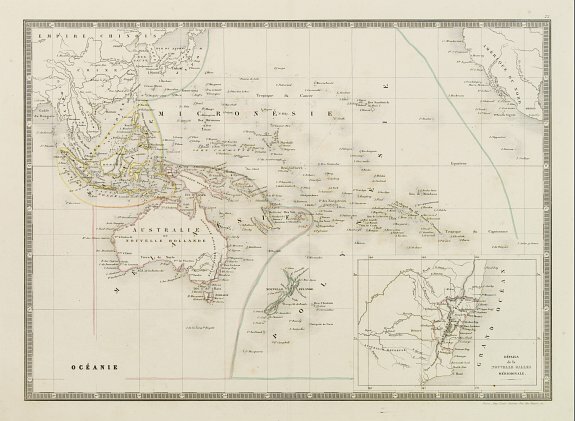 � An attractive map from one of the last decorative atlases of the nineteenth century. 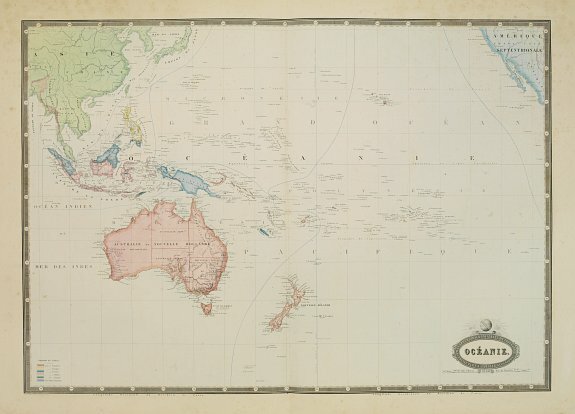 The map covers the entire South Pacific including Australia and New Zealand and Southeast Asia. The surrounding steel engraved scenes feature the natives of the region, portraits of French explorers and a harbour vignette. Engraved by Laguillermie, the outer decorations are the work of Raimond Bonheur. 259 ANONYME. 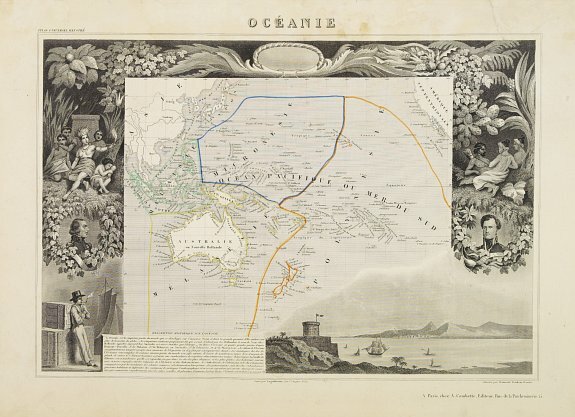 Carte de l'Oceanie. Paris ca. 1860. In original o/l colours. With wide margins. Some staining, mainly in the margins. 303 x 436 mm. ORDRE D' ACHAT / Inquire/Order item N� 3032. 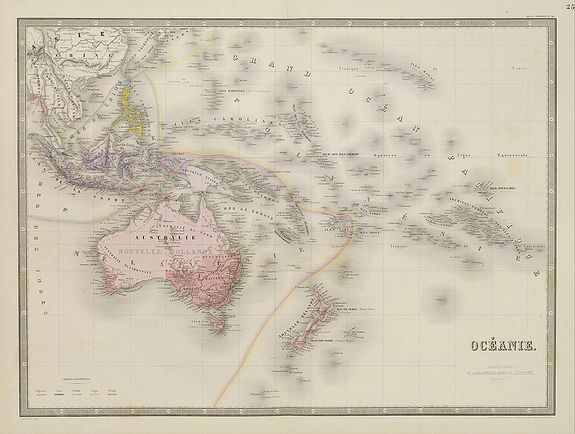 � Steel engraving of Australia, New Zealand and Indonesia. Engraved by Thierry. 260 GARNIER,F.A. Oc�anie.. Paris, 1860. In original colours. Some marginal staining. Else good. 500 x 705 mm. ORDRE D' ACHAT / Inquire/Order item N� 3265. � Very detailed map from "Atlas Spherodidal & Universel de geographie", Prepared by F.A.Garnier and edited by Jules Renouard, rue de Tournon, Paris. 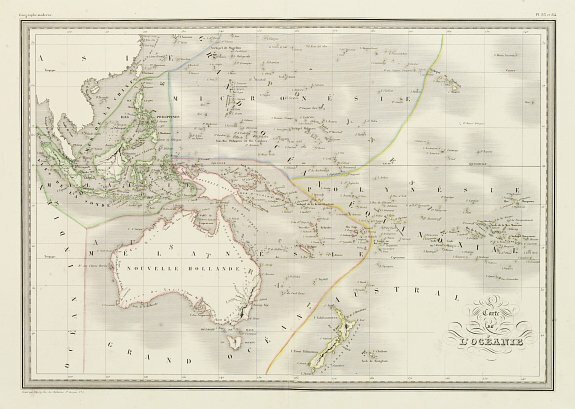 Uncommon map of the Pacific, including Australia, New Zealand, Indonesia, Japan and part of the California coast. With decorative title cartouche lower right. 261 WYLD, J. 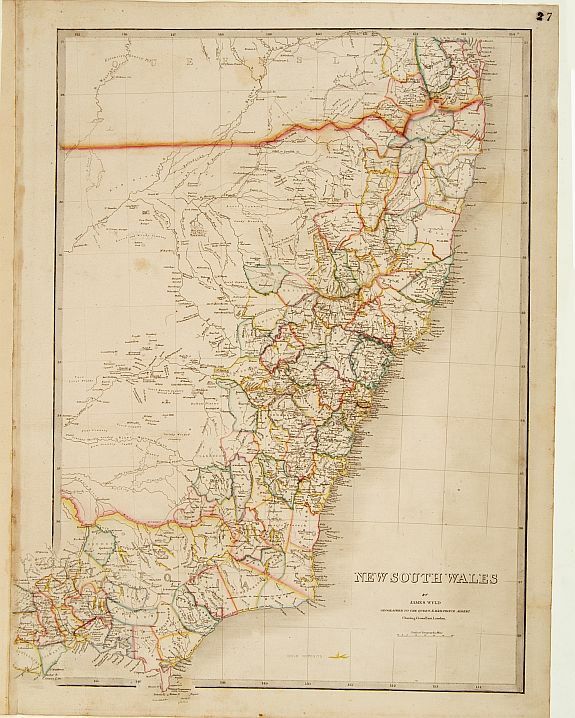 New South Wales.. Londres, 1855/1863. Limites en col. ancien. Printed on heavy paper. Very minor age-toning but generally in good condition. 550 x 415 mm. ORDRE D' ACHAT / Inquire/Order item N� 5947. 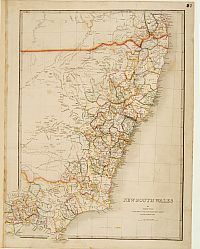 � Very detailed map of New South Wales. The gold deposits are maked in yellow. James Wyld (the younger) was geographer to the Queen and H.R.H. Prince Albert. Joined his father's business in 1830. His address was from 1835 until 1860: Charing Cross East next door to the Post Office and 457 Strand. As Queen Victoria married Albert in 1840 his imprint changed to Geographer of the Queen and H.R.H. Prince Albert. From his "A New General Atlas of modern geography..". Map is very finely engraved and coloured by hand. 262 WYLD, J. Tasmania or Van Diemens Land.. Londres, 1855/1864. Limites en col. ancien. Printed on heavy paper. Generally in good condition. 543 x 390 mm. ORDRE D' ACHAT / Inquire/Order item N� 5948. 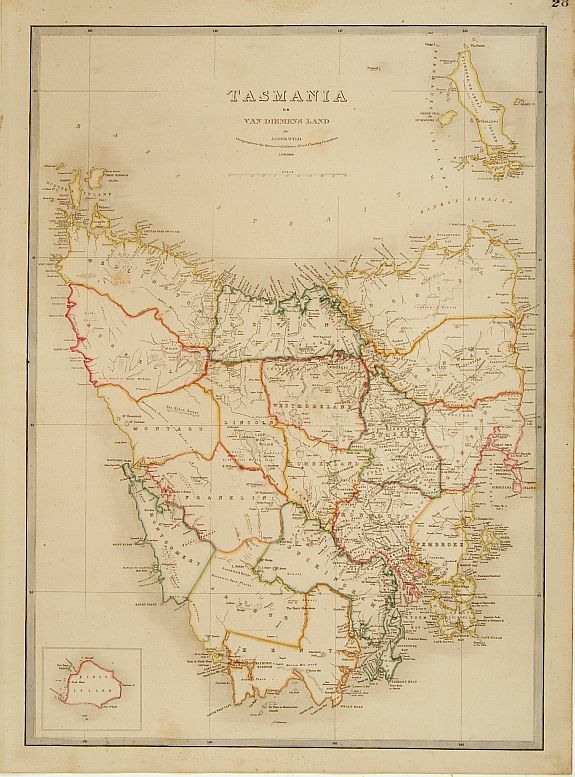 � Very detailed map of Tasmania with inset map of Kings Island. James Wyld (the younger) was geographer to the Queen and H.R.H. Prince Albert. Joined his father's business in 1830. His address was from 1835 until 1860: Charing Cross East next door to the Post Office and 457 Strand. As Queen Victoria married Albert in 1840 his imprint changed to Geographer of the Queen and H.R.H. Prince Albert. From his "A New General Atlas of modern geography..". Map is very finely engraved and coloured by hand. 263 ANDRIVEAU-GOUJON,J. Oc�anie. Paris, 1865. Original o/l colour. Steel engraving. In good condition. 458 x 622 mm. ORDRE D' ACHAT / Inquire/Order item N� 8402. 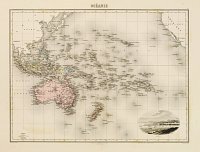 � Detailed map of Australia, New Zealand, Indonesia and the Pacific. With a colour key indicating English, French, Dutch, Spanish and Portuguese possessions in the region. From his "Atlas Universel." 264 DE MIGEON, J. Oc�anie. Paris, 1874. Original colours. Steel engraving in good condition. With some usual very minor spotting. 315 x 422 mm. ORDRE D' ACHAT / Inquire/Order item N� 2038. � In lower right hand corner a view of Noum�a. Showing the Pacific including California. Engraved by L.Smith. 265 KIEPERT,H. 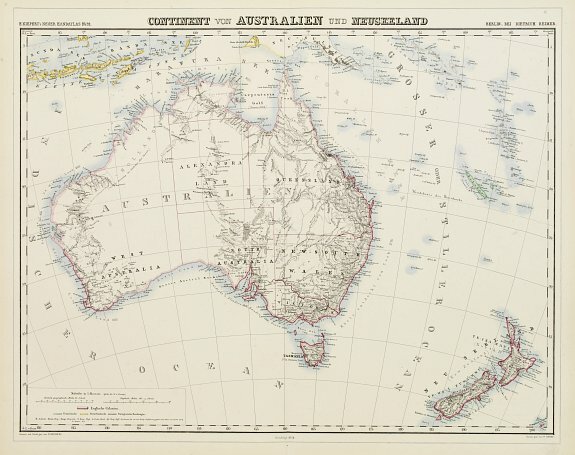 Continent von Australien und Neuseeland Weimar, 1874. In original o/l colours. In good condition. 420 x 550 mm. ORDRE D' ACHAT / Inquire/Order item N� 9712. 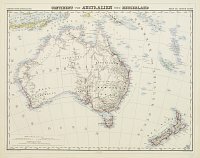 � Large and detailed map of Australia and New Zealand. With colour key in lower left. 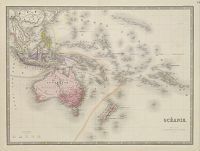 The map is prepared by H.Kiepert and published in Berlin by Dietrich Reimer. Engraved by W.Bembe. 266 AUBREE,A. Oc�anie dres�e par C.V.Monin. Paris, 1875. Original colours. Some very minor discolouration along centerfold, generally very good. 480 x 647 mm. ORDRE D' ACHAT / Inquire/Order item N� 5991. 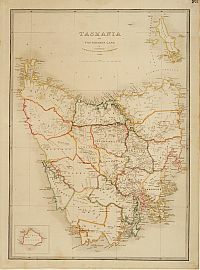 � Fine and uncommon map including Australia, New Zealand, Indonesia, with inset maps of New Zealand, Victoria/New South Wales and Western Australia including Albany and Perth. Prepared by Charles V.Monin, engraved by Jules Berthelemier. 267 ANTOINE, L. Oc�anie. Paris, 1880. Original colours. Steel engraving in good. condition. Repair of small tear next to centerfold. 283 x 390 mm. ORDRE D' ACHAT / Inquire/Order item N� 5607. 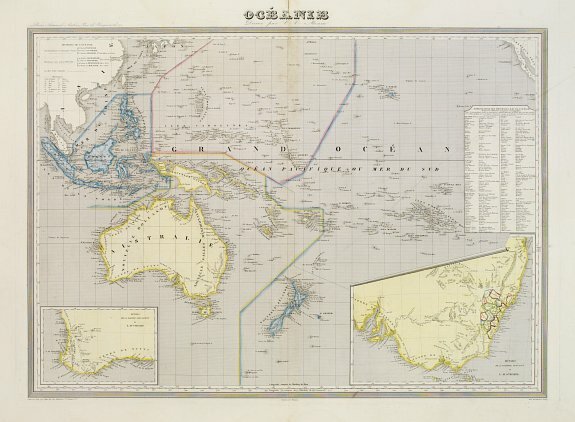 � Decorative map of the Pacific Ocean in cluding Indonesia, Australia, New Zealand and California. 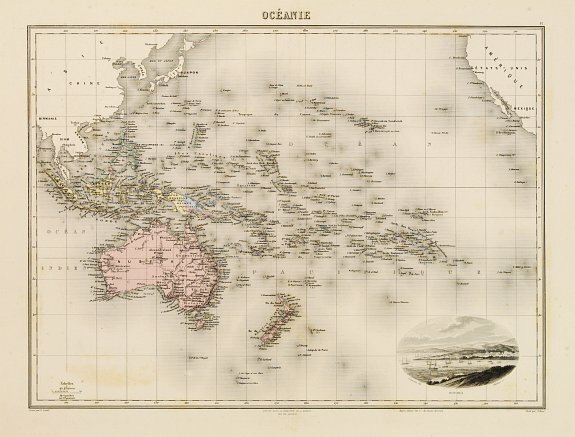 Lower right inset map "D�tails de la Nouvelle Galles M�ridionale", including Sydney.